This recipe for a simple vanilla ice cream is just really great and we have made it so many times now. 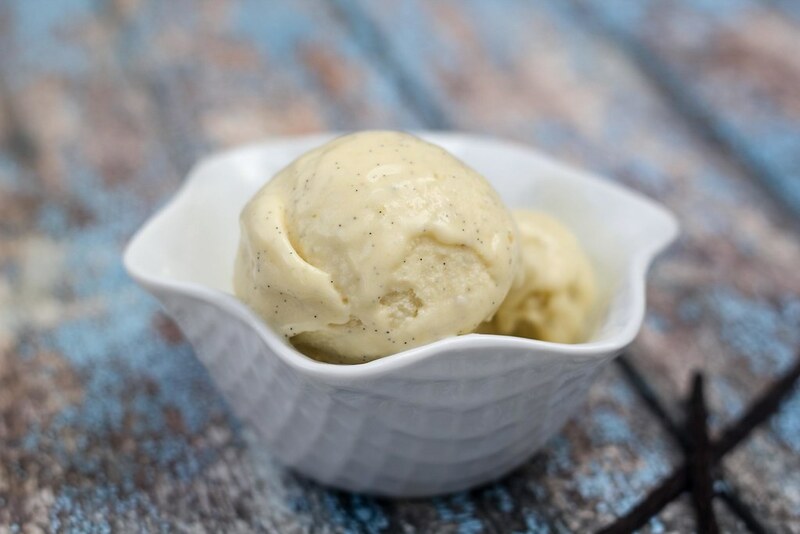 This recipe only contains simple ingredients and the vanilla is from fresh vanilla beans – it’s just super delicious and it’s way better than the ice cream from the super market. We also like the fact that we know the ingredients that are used to make this ice cream, and that it doesn’t contain artificial flavors and different additives and stabilizers. A vanilla ice cream is just really great as it is but we have also used it many times as a side dish for other great desserts like apple pie with cinnamon, grilled bananas or our very delicious chocolate cake with nougat. Step 1: Start by removing the vanilla from the vanilla bean. We have made a simple guide how to do this – click the link. Put both the vanilla and the empty bean in a sauce pan. Step 2: Pour the milk, heavy cream, and corn syrup into the sauce pan. Turn on the heat and let it boil for a couple of minutes. Step 3: While the milk/vanilla mixture is heating up, use a hand mixer to whisk the egg yolks and sugar in a large bowl. Whisk until the mixture is light and fluffy. Step 4: When the milk/vanilla mixture has boiled for a couple of minutes, slowly pour it into the bowl with the egg yolks while whisking. Step 5: Pour it all back into the sauce pan and heat it up at medium heat while constantly stirring. 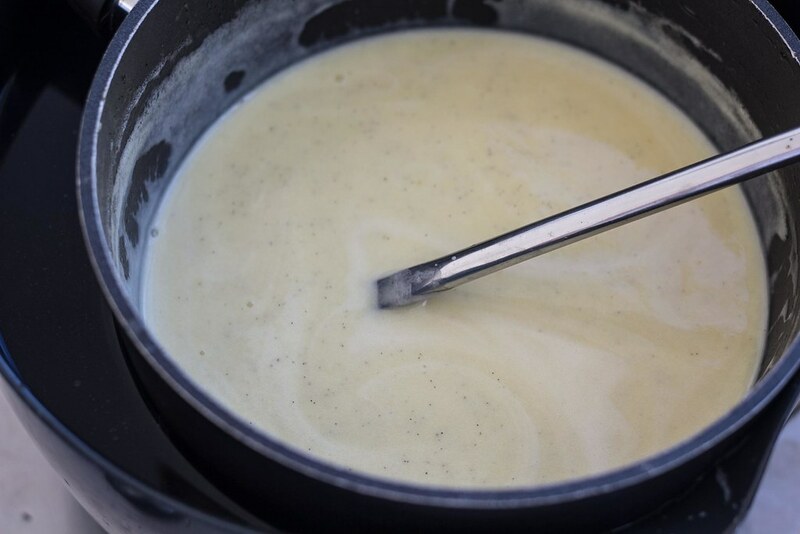 Don’t let the mixture get above 80 C (176 F) this will make the eggs coagulate – and we are not interesting in an ice cream that taste like scramble eggs. Step 6: When the temperature is closing in on 80 C (176 F) the ice cream mixture will start to thicken and you must remove the sauce pan from the heat and quickly cool the mixture down. You can quickly cool down the mixture by pouring it into a bowl which you then place in a larger bowl filled with cold water. Step 7: When the ice cream mixture is cooled a bit pour it into an ice cream maker and start it. If you don’t own an ice cream maker you can also just freeze it in your freezer – just remember to stir in the ice cream once every hour until it’s frozen. Extra: If you like this vanilla ice cream we can absolute recommend our Stracciatella ice cream which has the most wonderful taste of vanilla and chocolate.